This Chicken Enchilada Soup tastes just like the one at Chili’s, but you can make it home in under 15 minutes. I always order the same thing when I go to Chili’s for lunch: The Bottomless Soup and Salad. You get a big plateful of tortilla chips and salsa, a salad and a bowl of soup. I get a plain garden salad with no dressing and a bowl of the Chicken Enchilada Soup. I don’t eat them separately though; instead I ask that they bring everything at the same time. Then I eat the chips, salad and soup kind of like deconstructed nachos. I take a chip, dip it in the cheesy soup, then I add some lettuce or tomato from the salad and finish with a drizzle of salsa. Brilliant, right? 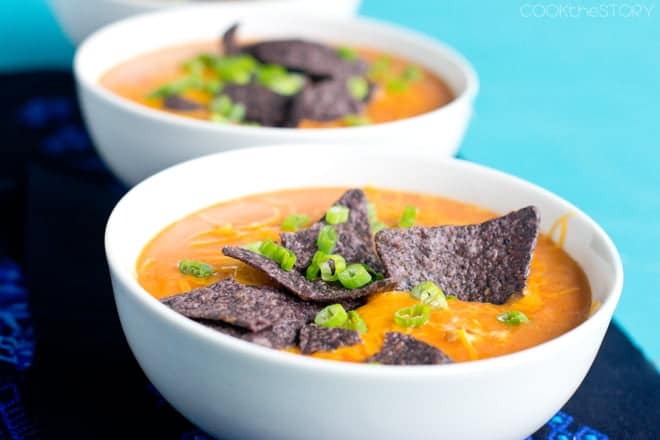 I think it’s the Chicken Enchilada Soup that makes this combination so delicious. It’s thick and rich and cheesy. 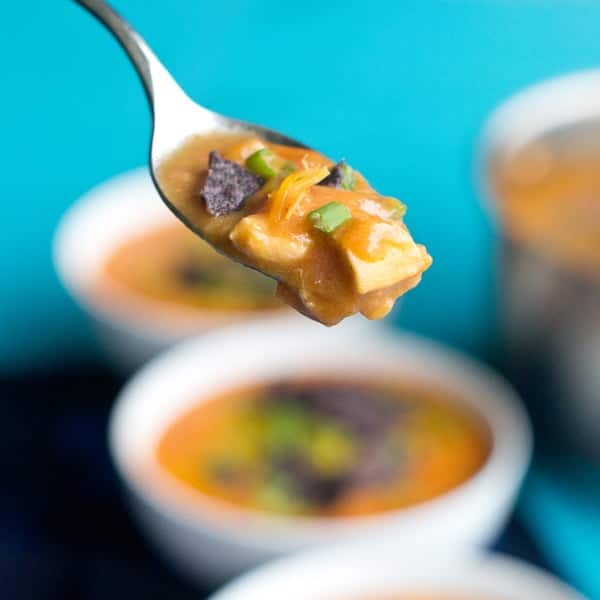 When I did some research to find out what actually goes into Chicken Enchilada Soup, I discovered that it’s not just the cheese that makes it so rich, flavorful and colorful. There’s an extra ingredient that I’d never cooked with before. It’s called masa, also known as corn flour. Usually used to make tamales and tortilla, masa is a flour made from dried corn. It’s a very fine powder, finer than cornmeal by far. Most grocery stores do stock it either in the flour section or in the ethnic section. But if you can’t find it, here’s a link to get it online. 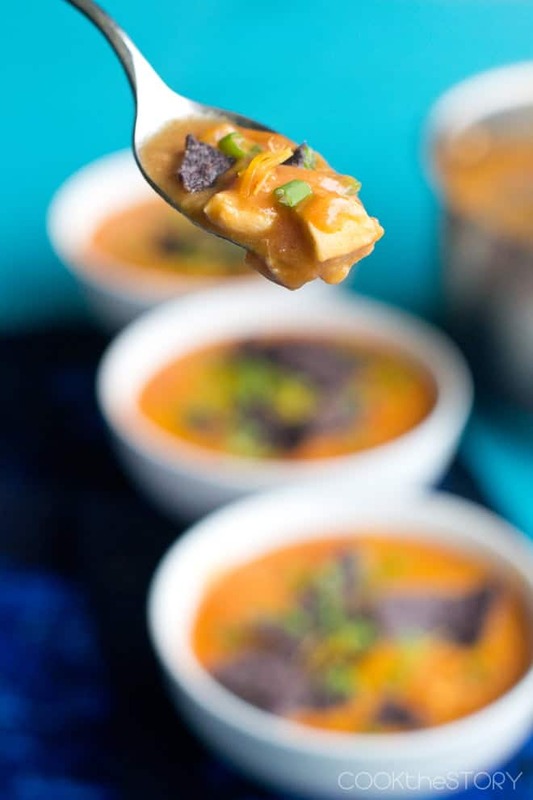 The masa thickens the soup and also adds a flavor similar to tortilla chips to the whole dish. I liked using masa so much that I have since added it to two other soups as a thickener. A great new SouperTip for making quick and delicious soups. To get all my other easy soup tips, head over here. 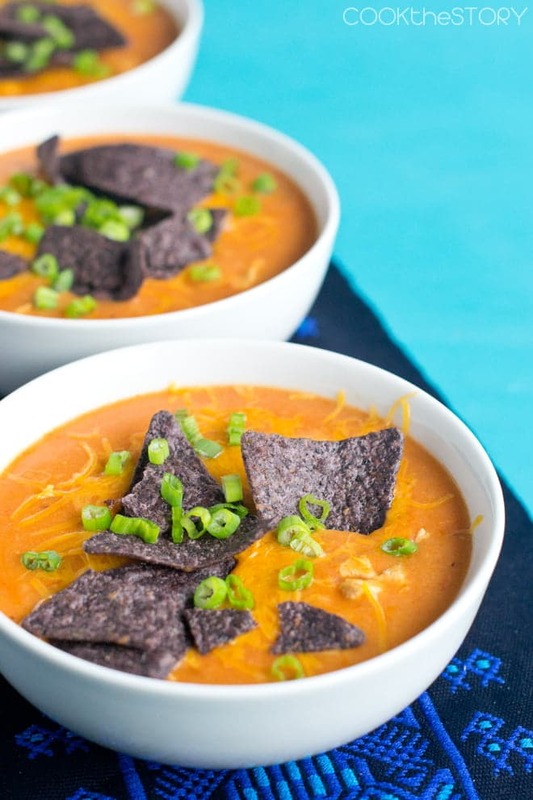 This easy soup tastes just like the one from Chili's. To make it in under 15 minutes, first read through the recipe. As you read gather together all of the tools, pots and pans and ingredients that you'll need. But don't worry about doing any prep. All of the prep is within the instructions section and is included in the 15 minute time of the recipe. Yield 8 cups. Measure the broth into a microwave-safe bowl and put it in the microwave on high for 6 minutes. Pour the oil into a large pot or Dutch oven and put it over medium heat. Chop the onion and add it to the pot. Stir. Chop the chicken breasts into 1/2 inch cubest. Increase the heat under the pot to medium-high and add the chicken along with the cumin and salt. Stir and cover. Cook until white on all sides, stirring occasionally, about 2 minutes. While the chicken cooks, chop the green onions and open the cans of crushed tomatoes, enchilada sauce and green chilies (if using). Drain the green chilies. Once the chicken has whitened all over, add the masa and stir. Slowly stir in the hot broth. Increase heat to high and stir well. Add the crushed tomatoes, enchilada sauce and green chilies. Stir. When it comes to a simmer, remove it from the heat and add 1 and 1/2 cups of the cheese. Stir. Ladle into bowls. Top with the remaining cheese, tortilla chips and green onions. 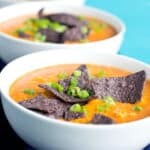 What color enchilada sauce do you recommend? I got red and my soup came out red not orange! Looks so tasty — and I love the quick prep time for a weeknight dinner. Now, if I could only have the ingredients magically appear in my pantry and fridge. Good Golly this has to be delish. Corn flour? Can’t wait to try it. This Enchilada Soup looks so good. This sounds so delicious and I love the idea of this with a salad! I would eat this in no time. So comforting. It looks fabulous!! I love how cheesy this looks! 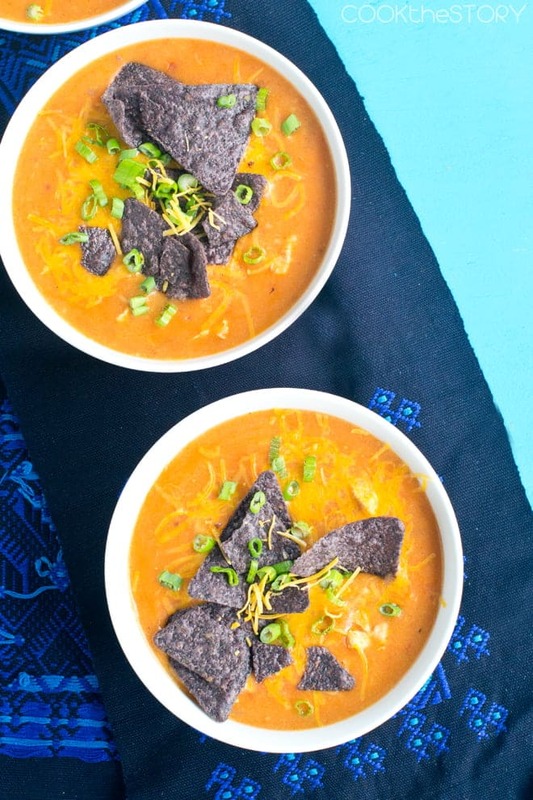 Your method for eating this soup is genius – I need to try! Now I know how to use Masa! Thanks! :))) The soup looks so, so good! Thick and rich, just the way it should be.